The Group View is generally similar in function to the Sample View, with the only major difference being that the Group View presents the average statistics for the members of the group. (e.g. if a group has three samples with 10, 15 and 20 reads in Exon A respectively, then the average read total for Exon A will be 15) Likewise, all numerical values such as PSI and magnitude would all be derived from average statistics. To get to this view, first select Group View in the View Combobox in the Data Selection Bar . Next, select the group that you wish to investigate using the DataSet Combobox also in the Data Selection Bar. When the group loads, the Results Panel will be loaded with all the splice events identified in the chosen group. 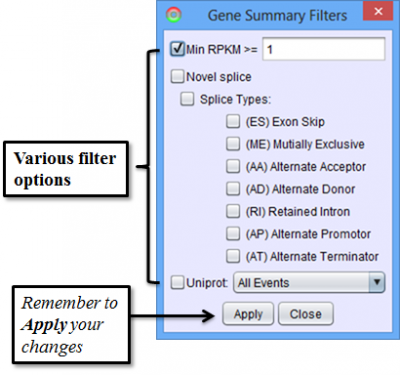 Gene Summary Tab of the Results Panel allows you to sort, filter, display, and export the results for each gene in the currently selected group. 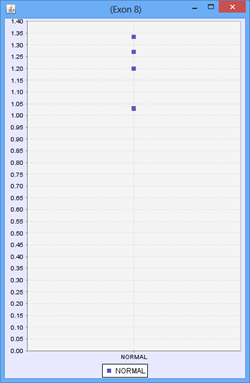 Num Samples- number of samples in the group expressing this splice event. 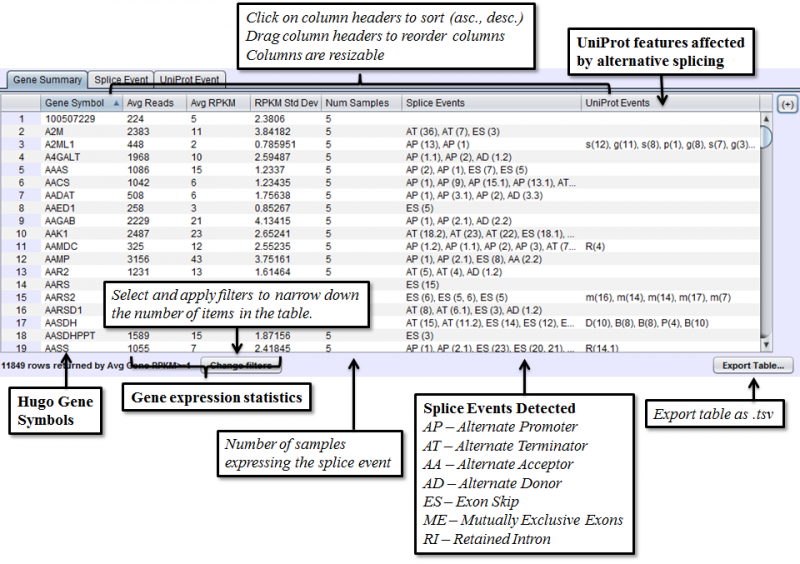 If a gene is not expressed in a particular sample, then that sample would not be counted towards this number for any splice events detected in that gene. 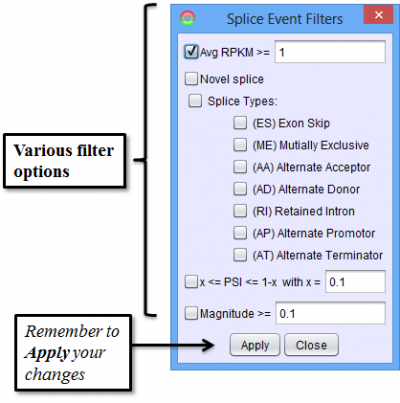 Splice Events - Categorized list of the differential splice events detected in the group on average. For example, ES(4) indicates and exon skip on exon number 4 that occurs more frequently in one sample. 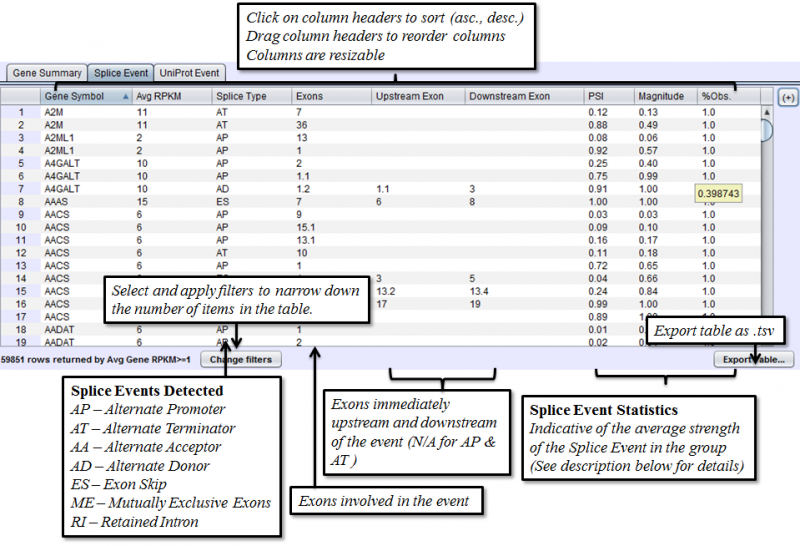 Use the Splice Event Filter drop down list to see the description and codes for each event type. 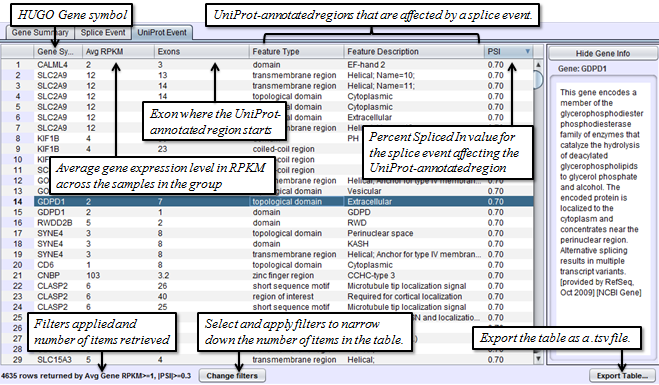 UniProt Event - Categorized list of UniProt annotated regions that are affected by alternate splicing events in the group on average. 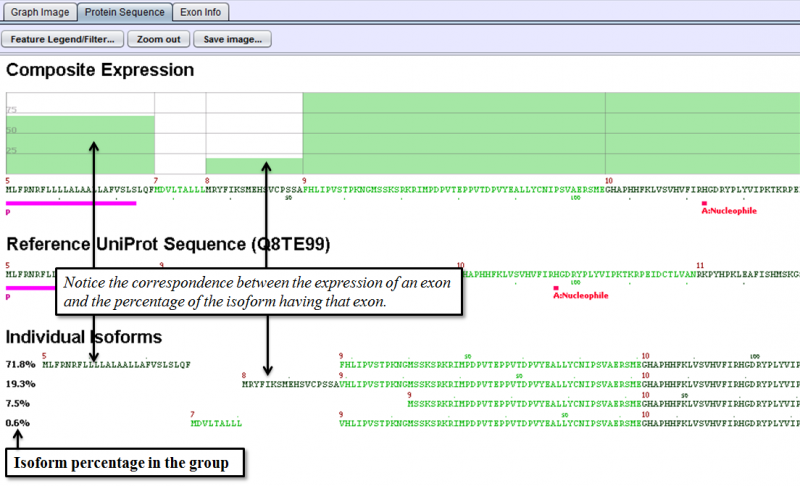 For example, B(9) indicates a Bind Site on exon 9 that is excluded more frequently in one sample’s isoforms. See the legend in the Protein Sequence Tab of the Gene Panel for a full list of UniProt annotation categories. %Obs. 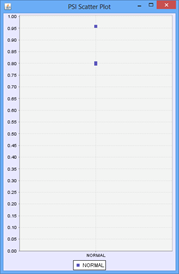 : The percentage of the group expressing the given splice event. If a sample does not express a particular gene, then any event on that gene would not be observed on that sample. Uniprot Event Tab in the Results Panel contains a row for every UniProt-annotated feature region that is affected by alternative splicing. Ratio: The ratio of group average OPKM for exon / splice over average gene RPKM. 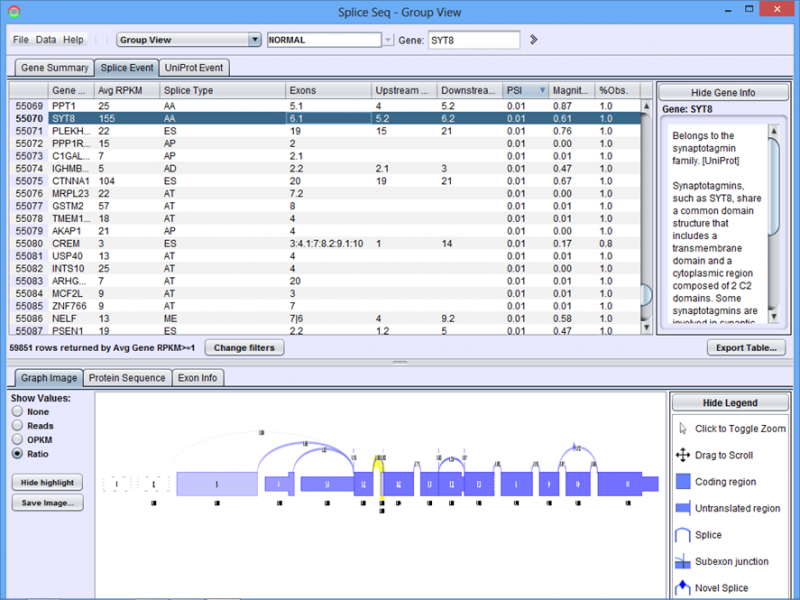 One additional feature provided in the Group View is the ability to investigate the distribution of values for any exon or splice. 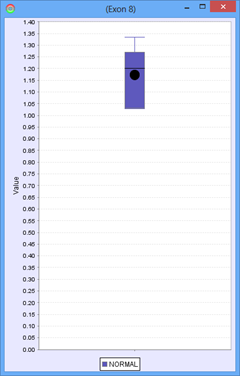 With OPKM, Total Reads, or Ratio selected, right click on an exon or splice line and then select either a scatter plot or box-and-whiskers plot. An additional window will open showing the OPKM, Total Read, or Ratio value for that exon / splice for each member of the group. These plots are helpful in determining if the exon or splice expression pattern is consistent across the group or widely variable. 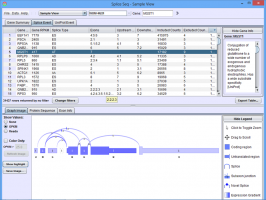 Protein Sequence Tab of the Detail Panel shows the protein sequence, functional annotation, and relative expression level of the isoforms inferred from splice patterns of the gene from the group. For basic information on this tab, refer to Protein Sequence Tab.